The other day I was at the gym, completely absorbed in my own thoughts, when suddenly I heard something very surprising and wonderfully familiar. Two women nearby were talking to each other in Italian. My neighborhood is not a particularly Italian one, so I had never thought to meet Italians at my local gym. I stuffed any shyness I felt into the nearest locker and asked them, in Italian, where they were from. We had been chatting for a few minutes when another voice piped up from the far side of the room, “Scusate, siete tutte italiane?” It turned out she was Italo-Australian. Before we went our separate ways, I told all of them about the Italian Professionals of Philadelphia, our local expat organization, because I know how hard it can be to find community. Sometimes you just need to be with other people who know the songs you listened to when you were a teenager, the cartoons you watched when you were a kid, the books you read in college, your favorite actors, authors… the list goes on. In a moment, she had reminded me of the first time I’d heard Italian and the reason why I’d wanted to learn it in the first place. She didn’t speak Italian or have those Italian experiences to share, but it didn’t matter. We had both shared that moment of recognizing the same beautiful thing––and that, right there, was an experience in common. I felt more at home, suddenly, just for having shared it. It reminded me that I don’t have to go looking for community. It’s all around me, including in unexpected places––I just have to reach out and make myself a part of it. That is how any expat can make a home. p.s. As usual, you can find this post on the PI-Philly Facebook page as well (see link above). As promised, beginning with the first post of 2017, the musings on the expat life that I’ve been writing for the organization of Italian Professionals in Philadelphia will be published in tandem here on my blog. Here is the first of the year! Although some of the details may be specific to the Italian-in-America (or American-in-Italy) experience, their themes are universal. I hope you will all enjoy them, wherever you come from and whichever the place(s) you call home. I was hard at work the other afternoon when my phone rang. A FaceTime call was coming in from Switzerland. A chorus of shouts and hellos greeted me as soon as I picked up, and there were all my Italian and Swiss-Italian friends from the Italian expat group I was a part of when I lived in Romania (they all live in Switzerland now). We used to have so much fun! We would seek out Italian pizzerias there (the pizzaiolo who worked at “Il Calcio” in Bucharest had learned his craft in Italy and made the most genuine pizza I’d ever had outside of il belpaese) and go to the theater… There was so much culture to be had in Bucharest, between opera, ballet and concerts. However, our favorite thing was when, at the Italian Cultural Center, they used to show DVDs of Zingaretti as Montalbano every Tuesday night. We never missed it. I hadn’t seem some of that group of friends in 10 years, but they’d been making la raclette (that’s Swiss fondue, for those of you who have never been fortunate enough to taste it) together in Geneva and thinking of the time when we all made it together in an apartment block in Bucharest, so they thought they’d call to say hello. Anyone who’s ever been an expat knows that, wherever you are on any given day, whether in your homeland or your adopted home, there will always be an ocean between you and at least some of the people you love. I am simply thankful that we have all this marvelous technology that means that we are never farther away from our friends and family than a thought and the time it takes to pick up our phones. The last few months of 2016 were not easy ones for Italy or America, and the coming months are certain to be full of upheavals and changes, some for the worse… but some things, like our friends and the good times we spend with them, whether in person or on the displays of our phones across the miles, never change––and no matter what 2017 may bring, that is a beautiful thing. Hello, dear Readers! 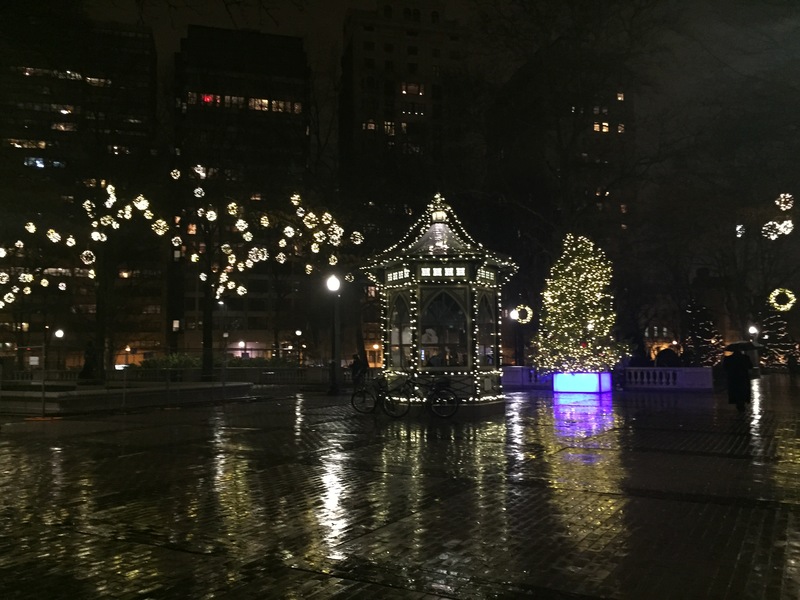 It has been a couple of years since I moved up to Philadelphia and, after a long hiatus, I’ve decided it’s time to get back to my blog. I’ve got to say, I’ve liked this town from the moment I first visited, and that feeling has only grown since. Of course, the fact I moved up here to be with my Special Guy has probably colored my view of things, to say the least. Some things haven’t changed so much. 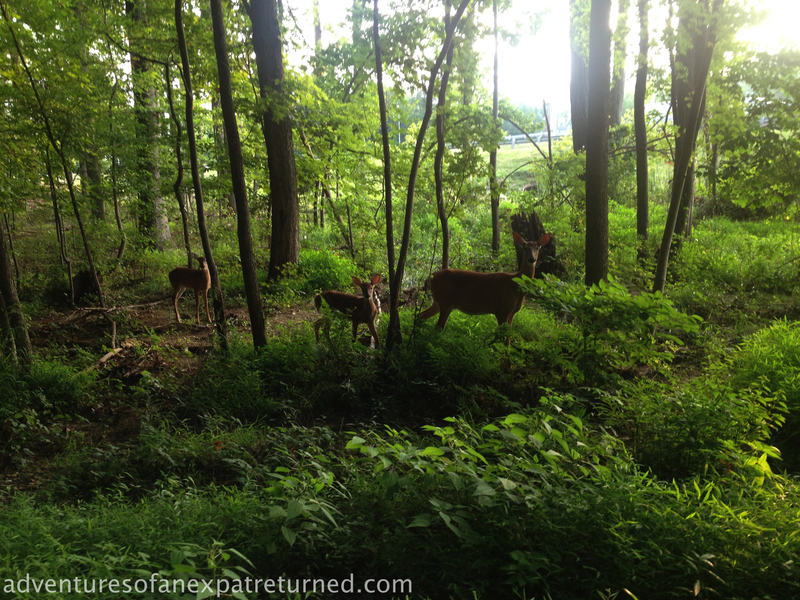 I still go running in the mornings, although now the view from my running path is quite a bit different from what it was in Virginia, as you can see… …no more deer, but plenty of neighborly locals with their dogs; no more woods, but I get the Schuylkill River trail. My Special Guy has been ensuring I get my share of Americana, too, because although I might be technically American, having spent nearly three decades overseas pretty much guarantees that I feel as much the expat here as I ever did anywhere else. What better place to get the full American experience than Philadelphia? (For my foreign friends who don’t know, this town is where the U.S. Declaration of Independence and Constitution were drawn up and signed.) I’ve seen the oldest continuously inhabited street in the U.S., run a 5K that started at the base of the “Rocky Steps” of the Art Museum, even been to my first ever baseball game… the list could go on for a while! Having an American guy to show me the ropes goes a long way to making me feel less of a stranger here, but, as is always the case in a new country, it can mean a lot to have a community of people who are strangers there, too. If they come from the same place you do, well, all the better. That’s why I was so happy to discover the Professionisti Italiani a Philadelphia. This group of Italian professionals welcomed me with open arms, understanding that, although I may not have an ounce of Italian blood, nearly two decades spent in their country makes me feel more Italian than anything else. Not only did they welcome me, but they asked me to start contributing a column to their Facebook page, to talk about the expat experience – both as American in Italy, and as an ‘Italian’ in America. It’s been nearly a year since I started, and beginning in 2017, I’ll be posting those monthly columns here on my blog, as well. 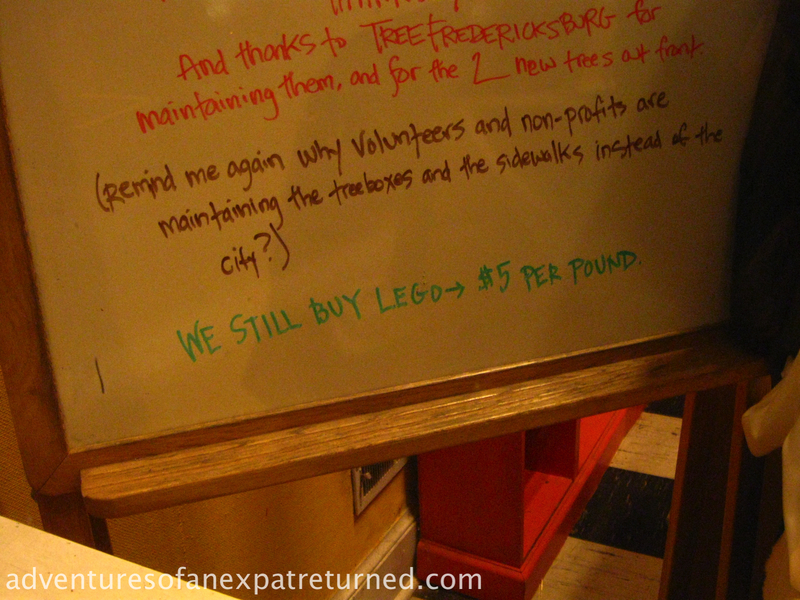 What better place to publish vignettes of the expat experience, after all? You can expect the first one shortly! Meanwhile, I look forward to seeing much more of you all in 2017. So far, this is one of my favorites. 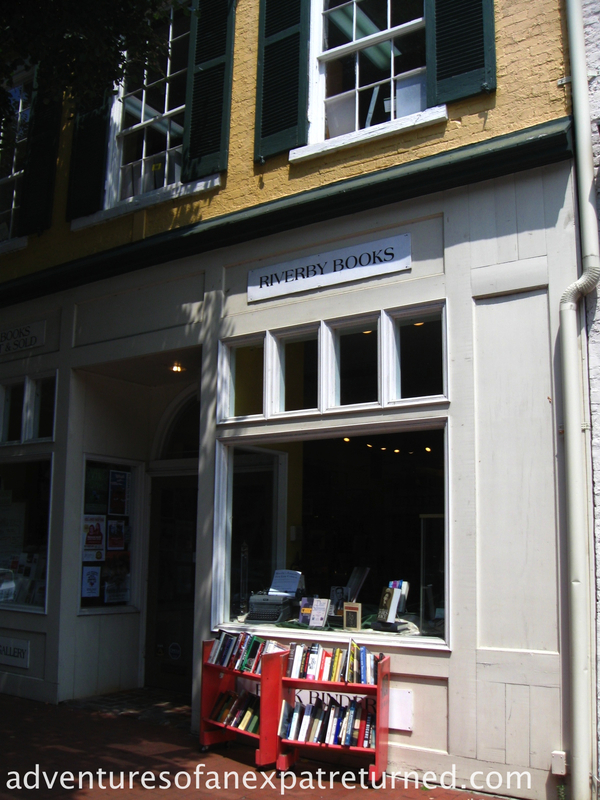 The Hyperion, in Fredericksburg, Virginia, is just at the limit of being too far to go to just for a few hours’ work on my day off. 50 miles each way is a little far for a half day. Gotta save this one for the whole-day excursions. When you work from home, however, you realize the value of having a change of scenery. No matter how nice the view from your window (and let’s face it, most views aren’t that great, although I’m lucky that way) it gets a little monotonous after a while. Go to a café, on the other hand, and you can people-watch when you need a break from looking at the screen. Go to one café often enough and you start recognizing the regulars, exchanging nods of greeting with them when you come and go… kind of like when you work in a large office. The other patrons and the staff take the place of the colleagues you’d otherwise exchange a few friendly words with every once in a while. Plus, call me strange if you like, but I sometimes find total silence more distracting than a pleasant background buzz of music and conversation. Of course, a café has to meet certain prerequisites if one is to comfortably work there. Most importantly, it has to have an atmosphere that’s friendly to patrons who come there to work. In other words, not every café owner wants quiet people with laptops camped out for hours, taking up space and not spending that much money over the course of the day. These types generally make it pretty clear by doing things like not making power outlets available to their customers or not providing free WiFi. It’s understandable and I can’t blame them for it. There should be different kinds of cafés, and some should be more conducive to socializing than working. In some countries there are no cafés where you feel comfortable pulling out a computer. Indeed, that’s one of the things I missed most when I lived in Italy – being able to go someplace and sit for a few hours out of the weather, reading a book, writing or just relaxing. Such a thing is a true boon, especially when you are traveling and need a place other than a hotel room to relax in for a little while. 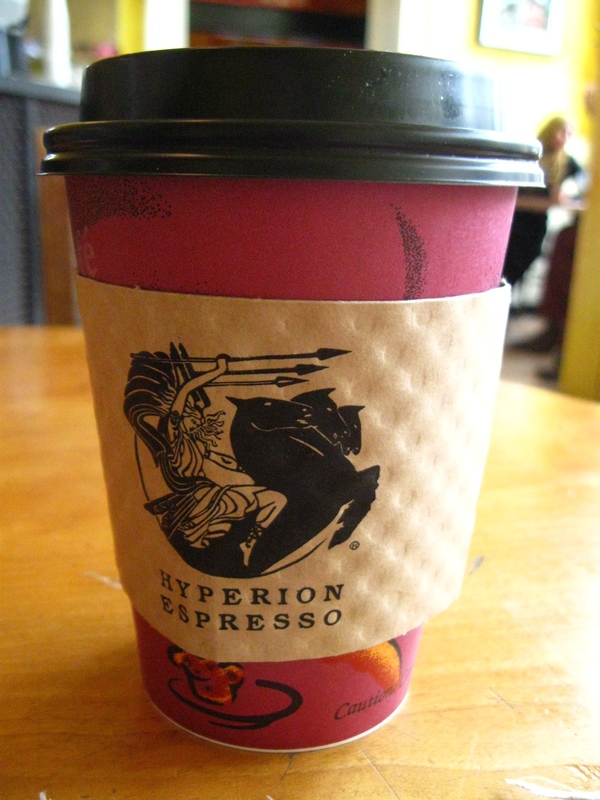 The Hyperion offers the best of both worlds. 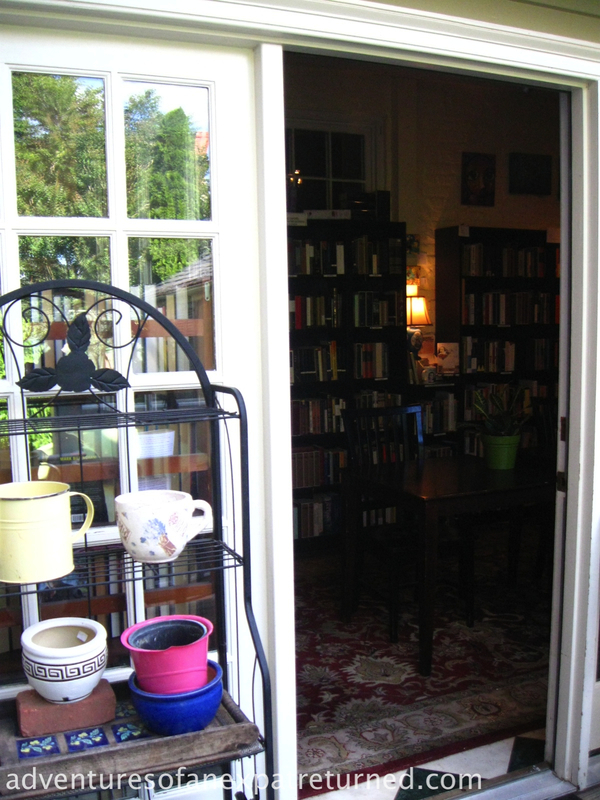 The front room is furnished with big, communal tables and full of the noise of conversation and music. Once you go into the back room, however, you discover that the sound system hasn’t even been wired to reach there (I love that!). Even the largest tables there are small enough that you don’t feel rude taking a whole one for yourself, and nearly each one is equipped with its own power outlet. Ah! This is café-writer bliss, indeed. What makes it even better is that the coffee is actually really good. I know, despite all that, you may think I’m nuts to make a round trip of a hundred miles just for a quiet day in a coffee shop with a cup of joe. This is why I’ve begun doing some exploratory excursions to find others closer to home. Don’t worry. I’ll be sharing my findings with you. I’ll meet you back here for a cup of coffee soon. Meanwhile, thanks for stopping by. Here is a link I stumbled across while writing this post. It’s to a post by a blogger in Singapore. I’m glad to see I’m not the only one who has made the quest for ideal cafés into an international pursuit. “Apples and oranges,” is my answer to that. I can’t compare it. Of course, there’s nothing like walking in the ancient Roman Forum or staring up in awe at the breadth of Brunelleschi’s dome in the Florence Duomo. Nature, however, inspires a different kind of wonder. Those of you who have been following my blog since its inception (and I thank you very much for sticking with me if you have) may have noticed a sea change over the past months – well, not counting the very long hiatus. 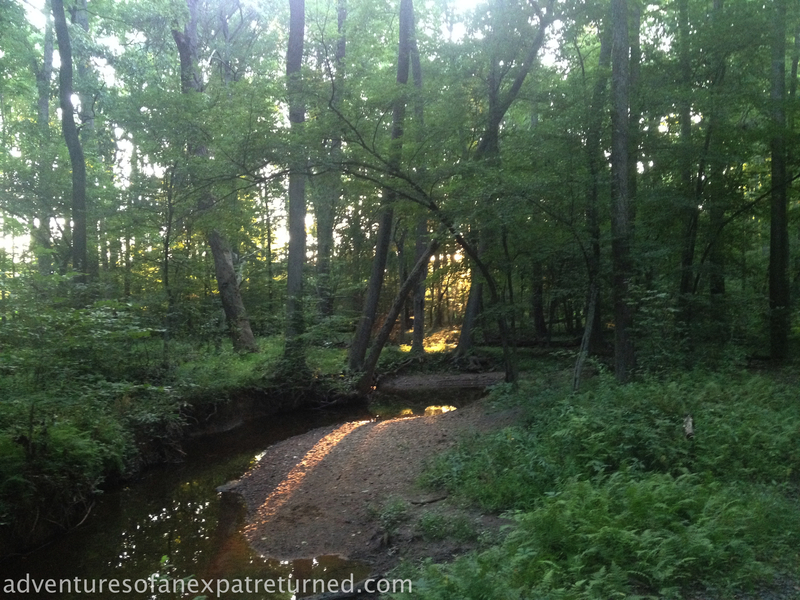 For the first few months of its existence, Adventures of an Expat Returned consisted mainly of posts about my explorations of the woods around my new home in Virginia. That is because my bicycle was, for my first eleven months in America, my only means of transportation. Things are far enough apart here that I couldn’t really go anywhere new. Neighboring towns and pretty much anything beyond my local supermarket, chain bookstore and chain coffee shop were quite literally beyond my reach. I was beginning to feel as though I’d exhausted my available subject matter when winter came. That pretty much put paid to bike rides through the woods in any case, no matter how good my intentions. I was reduced to taking pictures when family, friends or acquaintances organized day trips to somewhere new and I didn’t feel rude snapping tons of pictures. Then, in January, I took up a new hobby – running. This was something I never would have imagined myself doing, let alone liking… or loving. It took me awhile. From zero to my first real 5K run took me a good five months, but my initial doggedness has turned to a true passion for my new morning pastime. Best of all, it got me back out into my woods, even when the trails were too treacherous for a bicycle. By the time the summer rolled around, there was no way I was trading my sneakers in for my bike again. At the moment, I’m training for a half marathon – a fact I’m pretty proud of, if I do say so myself. I see some pretty amazing things in the woods in the morning. Apart from the aforementioned wild turkeys and deer, there is a red fox I occasionally spy through the trees and all kinds of birds – hawks, an eagle, even a great blue heron. 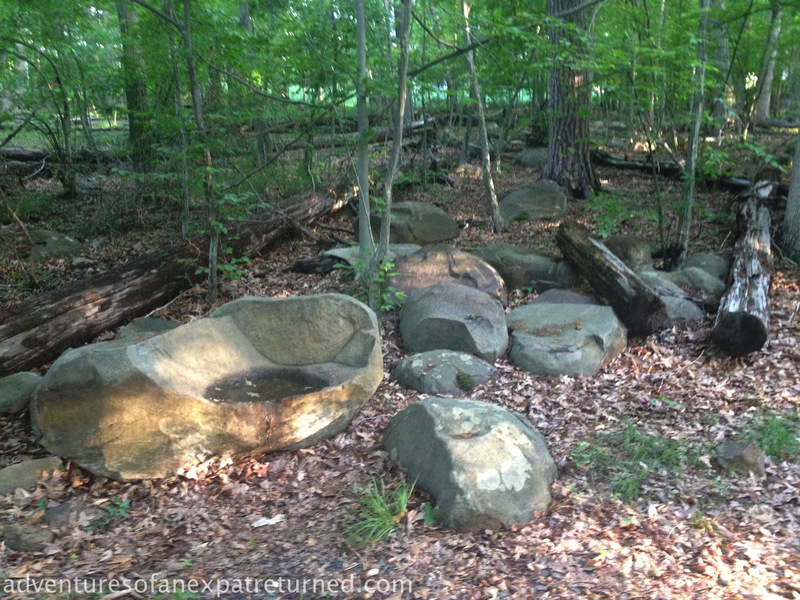 In the park where I go trail running, there are supposed to be coyotes. I haven’t seen any of those yet and, frankly, I wouldn’t mind if it stayed that way. However, there are also everyday scenes of trees, rocks and the stream that runs through them that catch the eye and make me pause, sometimes literally, if only for a moment. The problem is that, since I’m actually doing serious training, I can’t really stop and snap a picture the way I did when I was riding my bike for fun. Besides, then I had my backpack and could take my serious camera. Now I just have my phone’s camera. Let’s face it, the images just aren’t that great with those things, no matter how much we’d like them to be. All this to explain why my blog has gradually shifted from nature to civilization, from trees to coffee shops. What’s important to remember is that this never was intended as a nature blog. 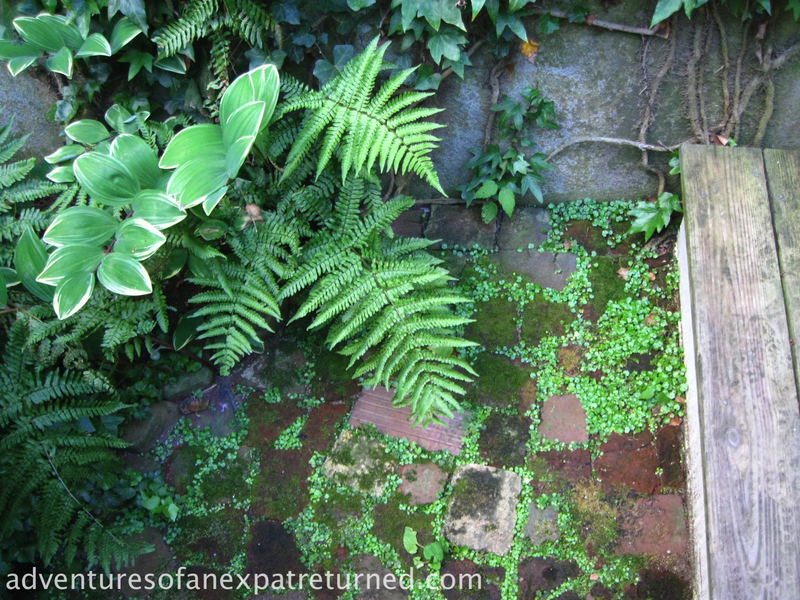 It was a blog to document the adventures of an expat returned. Those adventures have slowly grown in scope, from the woods behind my house to nearby towns and cities and I hope, someday, even further afield. Stick with me. There are so many adventures still to come. I’ve got the next one planned. The one after? We’ll see. That’s part of the fun, isn’t it? 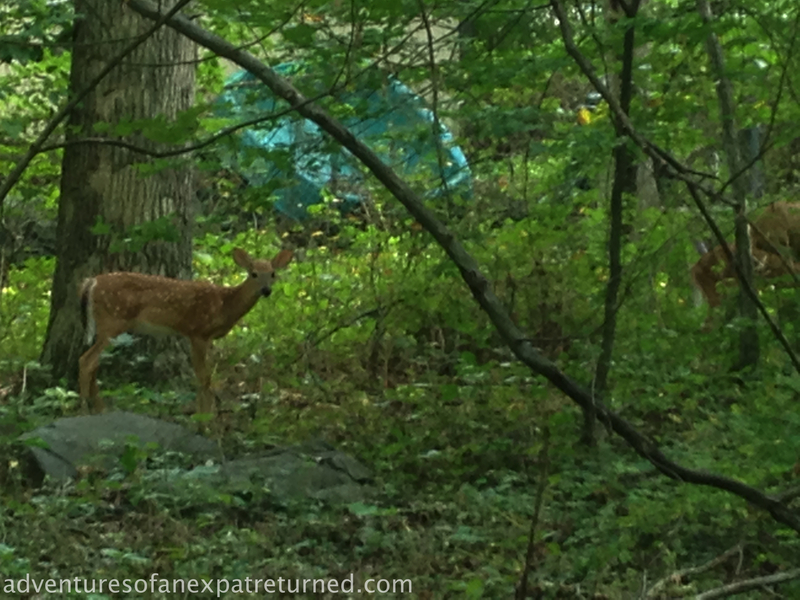 A rather blurry close-up of one of my neighborhood fawns, but still worth posting, I thought. They’re growing up fast. I suppose it actually has been 5 months since I put up a post on this poor, neglected blog. Most of you must have thought I’d fallen right off into the “Here There Be Dragons” zone of the map while seeking out new expat adventures. That might have been pretty fun, actually… well, if I’d had my dragon-charming equipment with me when I slipped off the edge of the world, anyway. Gladly, it’s a moot point. There are a few reasons for my long hiatus. The first is, simply, that it’s a very time consuming and sleep depriving endeavor to start your own company. The second is that, limited to a bicycle-riding radius around my home, I was beginning to run out of topics and inspiration. I couldn’t always wait for some occasion or someone else’s motor power to take me to some new town or place worth telling you all about. So, the big news is (cue drumroll) I finally got some motor power of my own. It took me almost exactly 11 months from the day my plane from Italy touched down, but it was well worth the waiting and scrimping. Perhaps you can imagine the way I felt when I first got behind that wheel and knew that I could go anywhere. Believe you me, when you’ve grown up in pre-Schengen Zone Europe, and Eastern Europe during the Cold War especially, it is not. I grew up knowing that you could only drive so far without running into a border – probably involving barbed wire and machine guns – and, even if you got to the other side, you wouldn’t be able to get a bottle of water until you exchanged your currency or ask for directions unless you spoke a different language. When I read that line as a child, I always thought about America. We’d come back from Europe for the summer holidays and go visit the grandparents. We’d pull out of their driveway to go somewhere and I’d think of the maps I’d studied in school and I knew that, if we just kept driving, we could go anywhere. We could drive all the way to the Pacific and never have to pull out a passport or a phrasebook. Of course, as an adult, one of the things I love best about traveling is the cultural diversity, the new sounds, smells, tastes, ways of speaking and even ways of thinking that other countries have to offer. That’s the beauty of traveling abroad. The fact remains, however, that I can reverse out of my driveway and the little road outside of my front door could sweep me off all the way to the Rocky Mountains, the Grand Canyon, the Painted Desert… all those places I’ve dreamed of and never seen. Someday I’m gonna do those things. What I can also do is return to some places I’ve loved and would like to get to know better, something I didn’t have the leisure or liberty to do until now (motor power!). I didn’t give up hope. The bag waited, ready with maps and camera. Yesterday I knew that today would be the day, and so it was. 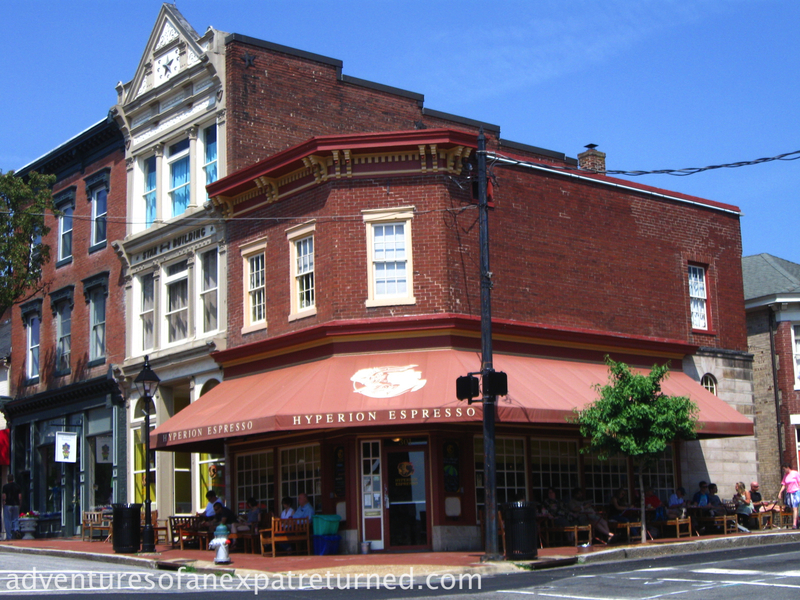 I set off – not for somewhere new and unexplored, but for someplace I already know and love and had been wanting to get back to for awhile: Fredericksburg, Virginia. 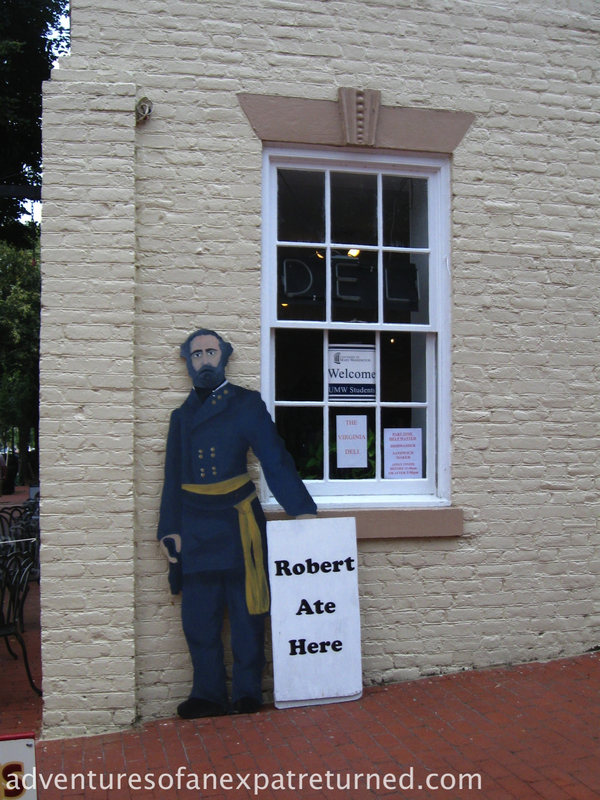 Those of you who have been following my blog may remember that I’ve already done a couple of posts about Fredericksburg. 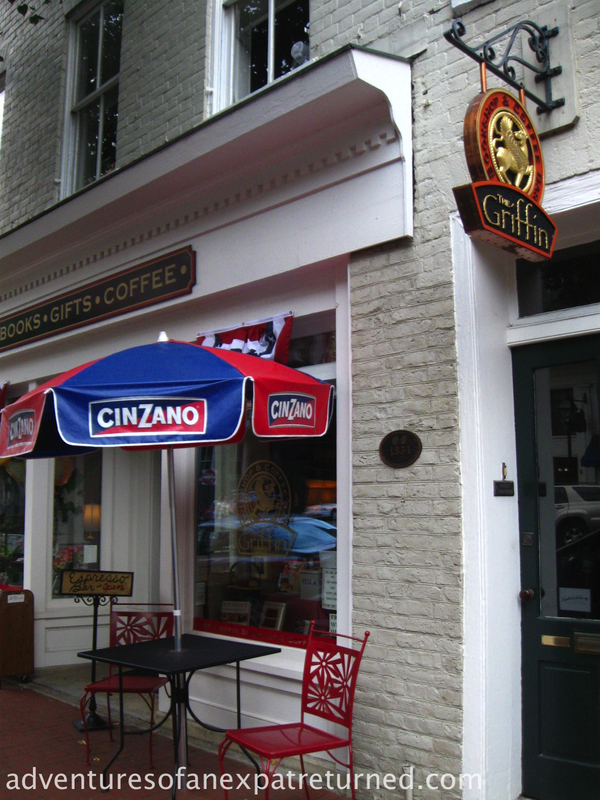 There was the “Sorry Mom” post and the “What to Do When It’s Raining (or Snowing) in Fredericksburg, Virginia”” post, about the Griffin Bookstore and Coffee Shop, which is where I happened to be sitting when I began writing this post (it ranks up there among my favorite places in the entire world). Not only do they have a wonderful selection of used books for pretty any much any taste, the also have some of the coziest rooms in the world and a garden that I could sit in for hours with whatever volume has decided to befriend me. 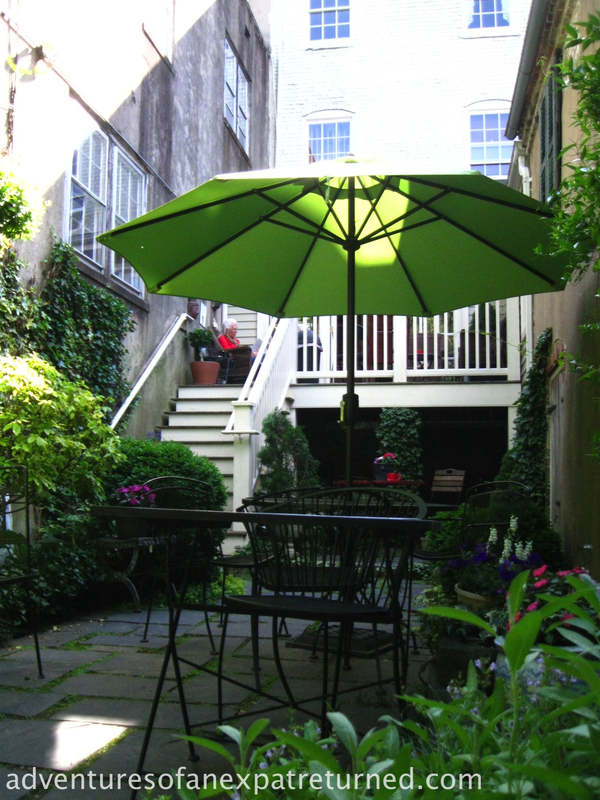 A cool refuge on an August day… and you’ll never get bored in there. Fredericksburg is, of course, a town with a ton of stories to tell. George Washington’s boyhood home was here, after all, not to mention the Civil War battle that took place here. On my first visit, when I’d only been back in the States about a month, I saw the historic homes, plantations and the battlefields. I took the trolley tour and explored the antique shops. Since then, I’ve been back a couple of times and, obligatory tourist stops aside, it’s also an extremely pleasant place to be. The locals are much friendlier than anyone would have any right to expect them to be in a tourist town such as this, there are more bookstores than grocery stores (Finally! A town with it’s priorities straight!) plus some really excellent restaurants. We’re not going to be serious today. Today, I’m going to show you some of my favorite shopfronts and store windows – the kind of things you spend your time looking at if you’ve already visited a couple of times before (which you have, if you’ve been following my posts). Enjoy! 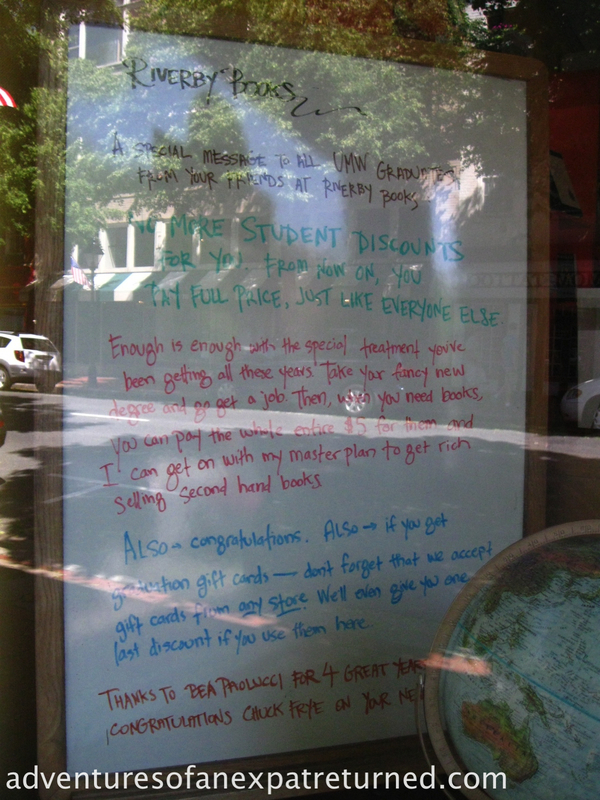 Let’s start with those bookshops. Besides the Griffin, there are a couple more right on Caroline Street, the main shopping drag, whose windows I always enjoy. 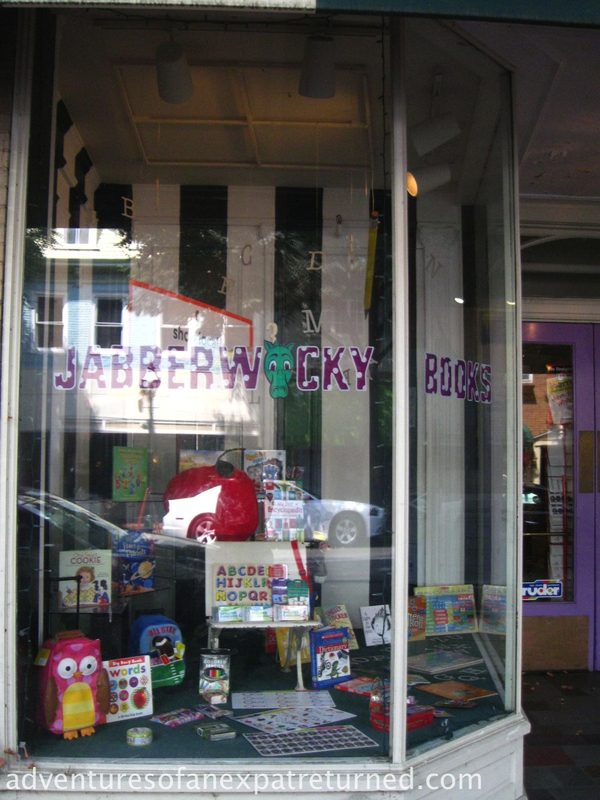 What a fantastic name for a kids’ bookshop. The stuff they have in the window is enough to make any small child with a big imagination (wait… that’s all small children, isn’t it?) write a very long wish list. The window isn’t that fun today, but I’ve seen it veritably brimming with the kind of toys that make me wish I were a kid again. 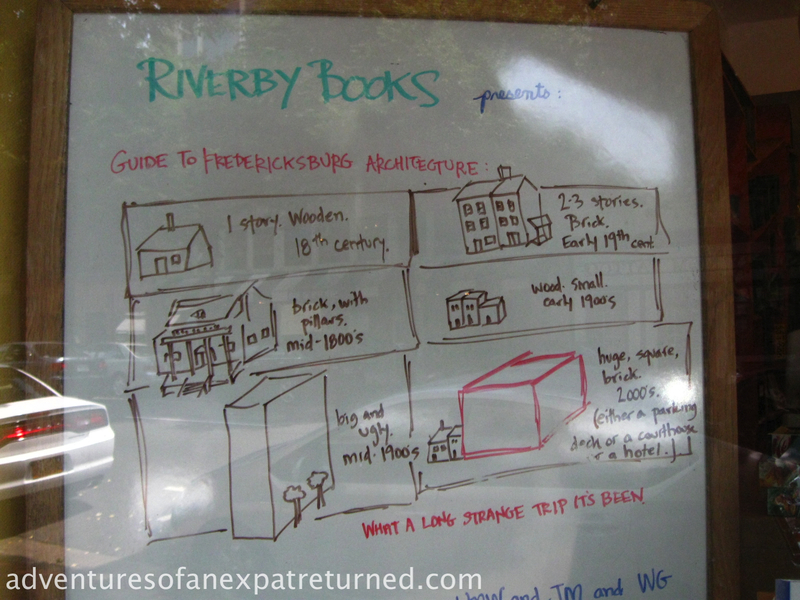 Riverby Books is a little more serious. The browsing is excellent but the lack of the coffee shop aspect means I’m not inclined to stay for quite so many hours… just one or two. This one was from around graduation time. I know the glare makes it hard to read, but give it a try. It’s worth it. He cleared everything up for me. Both George and Bobby have eaten there. Only, their likenesses are a little misleading: the former is the George who owns the Blarney Stone up the street, while Bobby owns an establishment a couple of blocks in the other direction. So, as you see, it’s all true. Later on, once the Griffin had closed its doors for the day, I turned my steps toward the Hyperion, the local specialty espresso shop and hangout for the kind of people (like me) who like to plonk their computers down on a table near an outlet and not move for a few hours. They’re open a little later, even on Sundays. A little caffeine jolt did me good for the ride home, which was rather more adventurous than the ride in. I decided to set my GPS to avoid any highways and see what would happen. What happened was rather a lot of cows, horses, deer and generally extremely windy country roads. It was a lot of fun, but I did get home quite a bit later than planned. What this means is that some of those photos I took and things I wanted to share will have to wait for another post. That’s ok, I’m sure I’ll be going to Fredericksburg again. 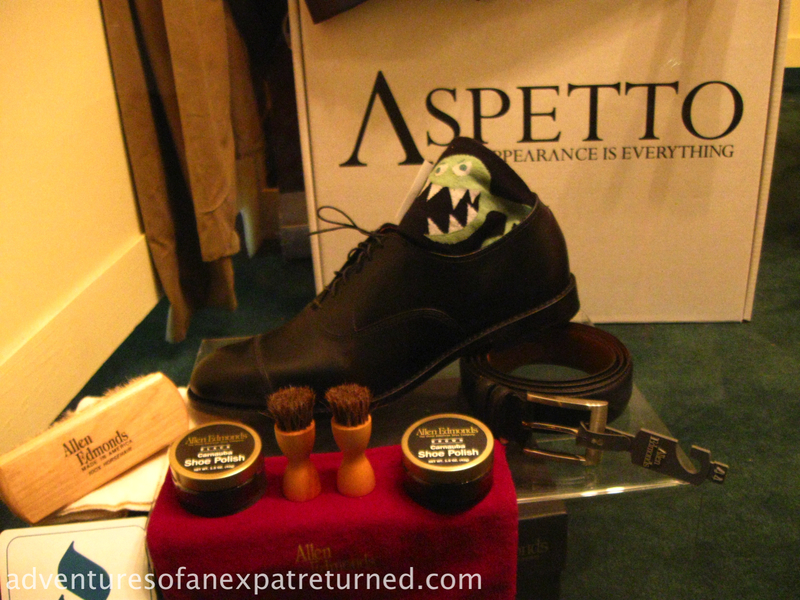 Super-sophisticated handmade shoes should always be paired with silly socks. How else would you wear them, really? Meanwhile, my new motor power should help finally have some new expat returned adventures. I look forward to sharing them here with you. Thanks for reading and see you again soon!